Did you know that your oral health can affect your overall health? Poor oral health can even worsen health conditions you already have such as diabetes or cardiovascular disease. That is because oral health and overall health are highly connected. Your oral issues can become better with braces, but that is only if certain oral health problems are corrected beforehand. Patients can also develop oral health problems if they don’t have the right knowledge with proper braces care. 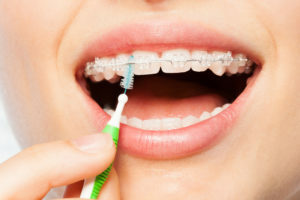 Use these tips to avoid oral health problems with braces and find out how we work around current problems to provide you with a straighter smile! Braces are a big commitment, and you want to make sure you’re using the correct ones whenever you get them put on. Each of us is a different size and shape, and are mouths aren’t any different. Because of this, there are various types of braces for different sizes and shapes of mouths for children, teenagers, and adults. The four most common types of braces are: traditional, short-term, clear, and Invisalign/ClearCorrect. 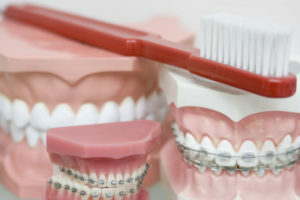 Traditional braces are those that we see on a daily basis: a system of wires and brackets that are bonded to our teeth. This type of braces are the most cost-effective, reliable, and are best suited for severe orthodontic issues. Short-term braces are recommended for those patients who wish to align just their front six teeth-the ones that others see the most. 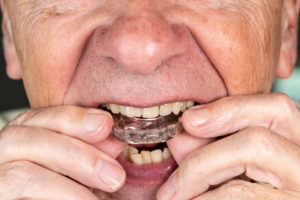 These are used for the shortest amount of time (less teeth to align), but there is no adjustment to your occlusion (bite). So if you have a problem with an under/overbite, short-term braces may not be for you. Clear braces are similar to traditional metal brackets except that they use ceramic brackets that match the color of your teeth. These braces have a high aesthetic appeal for those who don’t want to be seen wearing braces, plus they are highly resistant to staining. Invisalign//ClearCorrect straighten your teeth without the traditional wire brackets, and are completely removable, which makes cleaning your teeth a cinch. This type requires more responsibility for the wearer, but if you’re committed to the strict wearing regimen, you can have a straight smile in as little as 12 months! While similar to managing our oral health, maintaining our braces has a few extra steps. To maintain good oral health with braces, it’s important to adopt good oral hygiene throughout the entire process. Brushing after every meal is one of the most important but most overlooked steps in maintaining good oral health. When eating, food particles get stuck in between our teeth and our braces, which can cause staining and bacterial backup between our teeth. Using a regular soft brush in an up-and-down motion on each tooth will do the trick. Secondly, use threadable floss or a floss threader. These tools allow you to get between each tooth and underneath the wires to clean out any food that may be trapped there. Insert the threader between two teeth and move back and forth until the food is released. Lastly, use a proxabrush, or a “Christmas tree brush.” Place the proxabrush between two brackets, below the archwire, and brush up and down. Like the threader, this will also help loosen up any food that may be stuck between your teeth. A great way to ensure that your braces don’t break and that you don’t get unwanted gunk stuck in them is to watch what foods you’re eating. Foods that are hard, sticky, or high in sugar should be avoided. Eating food that is high in sugar can cause cavities when wearing braces, which can lead to more dental work that you would need to have done. 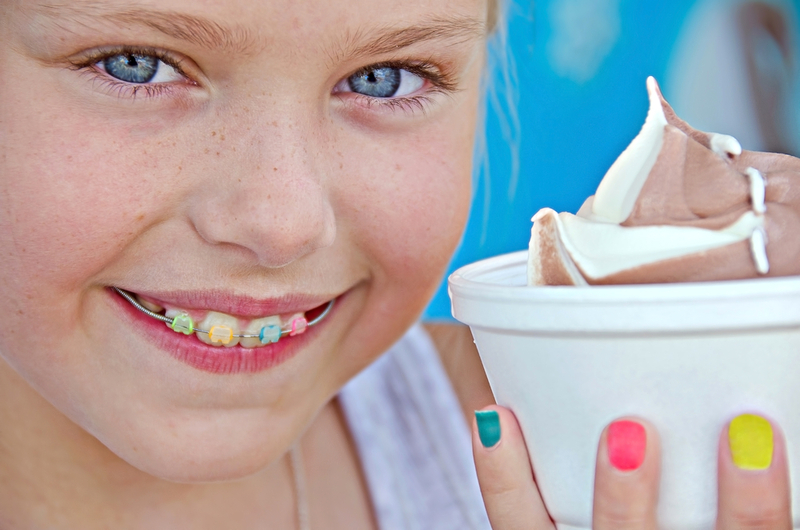 Furthermore, patients with braces should limit between meal snacks and avoid food that could bend the wires, such as caramel, nuts, chewing gum, ice, or popcorn. As mentioned earlier, these are signs that your oral health might not be up to par like it should be. Meeting with your orthodontist and discussing these issues will help them better treat you with one of the four types of braces that we discussed previously. The sooner you get in to see your orthodontist, the sooner any pain or discomfort can be evaluated, treated, and extinguished. Meet Your New Year’s Resolutions With Our Help! Belmar Orthodontics can help you on your path towards having a straighter smiles and better oral health. With reputable orthodontists, manageable treatment plans, and services for children and adults, we can help you get the smile that you deserve! Call (303) 225-9016! Braces: How Are They Made? You may wonder what the differences are between metal, ceramic, and lingual braces and how they compare to Invisalign treatment. All are a bit different and they are both made and worn differently. Braces are made from various materials and designed specifically for your mouth. 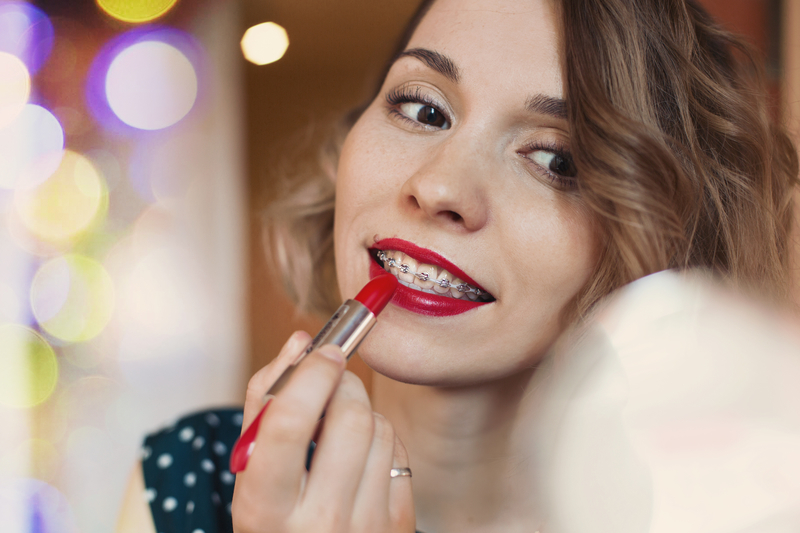 You’ve likely seen someone wearing metal braces and you know that they make your teeth straighter. But how? It takes a bit of science and the right orthodontic appliance to make that beautiful smile happen. With the most common type of braces—metal braces—you have a stainless steel material that is shaped into specific orthodontic parts that will all go together in your mouth. Often those parts are molded and shaped in a special lab that then ships those parts to orthodontists. Brackets: These stainless steel pieces are those little squares bonded to the middle of each tooth. We use a special bonding glue that will stay on your teeth for the entire duration of your treatment, but will come off easily with the right orthodontic material. Your brackets are small anchors that hold a wire in place. They will have tiny rubber elastics placed around them to protect your teeth and prevent stuck food. Archwire: This metal wire will pass through the brackets on each tooth, all the way to the back of your mouth. Many patients have a bracket that wraps around the back molar that stabilizes this archwire. The wire will follow the curve of your jaws in an elongated have circle. When a thicker archwire is placed or when this archwire is adjusted, it can help move the teeth into place because of the force placed on the brackets. Ligature Elastics: These are the rubber elastics we mentioned. The elastics are what keep the archwire sturdy so it can straighten your teeth. Your archwire will be adjusted very slightly at your orthodontic appointments every 4-6 weeks. That slight adjustment may seem very small, but it’s what your mouth needs to make a true, straightening change. The appliance is not the only thing changing your teeth into a straighter position. Your teeth are the hardest substance in the body and can even be harder than many metals. Straightening them would seem very difficult, when it’s not. It simply takes time. Your teeth can take a ton of force from chewing, biting, eating, talking and other actions because they are rooted into your jawbone. However, the jawbone is much weaker than the teeth are. So why doesn’t your jawbone get breaks in it when you chew hard things? You have something called the periodontic ligament that is around every tooth root as it goes into your jaw bone. All those ligaments are shock absorbers for your jaws when you chew, minimizing the force your jawbones take. These are key to straightening the teeth. When orthodontic appliances are on the teeth, they will apply a very slight pressure to your teeth and to the periodontic ligaments that surround them. When that pressure is constantly there, your body will produce acids in the jawbone area that will break down tiny parts around the teeth. With new space created, the teeth can shift. Your body will naturally deposit more minerals in areas that have changed to strengthen the jawbone once more. Over time, your jaw is literally breaking itself down on a microscopic level and then rebuilding itself. That is why orthodontic treatment takes months. However, the result is worth it. Ceramic and lingual braces are very similar to traditional metal braces, but are made a bit differently. Lingual braces are also a metal braces type, and most types are made from stainless steel in a lab. There can be other types of metal used or a combination of metals. These braces will have brackets and wires just like traditional metal braces, except that they will be placed on the back of a patient’s teeth. Because of placement, children are not usually candidates for lingual braces because of the size of the teeth. Dental impressions of the back of the teeth are made so that metal coverings can be made for the tooth backs, which is a bit different than traditional metal braces. More anchoring is needed with lingual braces, and this is how it is done. The metal material will cover the entire tooth back with a bracket in the center of the tooth, and each is placed individually when a patient gets their appliance. The archwire works the same as other braces. Ceramic braces are very similar to metal braces in their design and how they work. However, they are made from ceramic material, which is naturally white already. This makes the braces blend in with the teeth more, and the metal can even be frosted to blend in with whiter teeth. Invisalign treatment is an orthodontic option that is vastly different than your other options. The most noticeable difference is that there is no metal or ceramic material in your appliance. A patient will have digital images taken of their mouth. With that image, custom aligners are made that a patient will switch out each week. These are a type of plastic material patented by the Invisalign company. It’s a strong enough plastic to cause the same type of shifting you want your teeth to do. Aligners fit snug in the mouth as they are custom made, are switched out each week, and must be worn 20-22 hours of the day. If you are interested in any of these types of braces or want to see how the braces are put on a patient, call Belmar Orthodontics today at (303) 225-9016 with your questions! The holidays are here, which means parties, dinners, photo opportunities and more. Now is a great time to make your smile shine, and you can do that through orthodontic treatment. If you’re smile is lack-luster, consider our four orthodontic options that can help you have a straighter smile. For those already with braces, you can dress up your brackets with bright colors to reflect the season. Use these tips for getting a more beautiful smile with braces and having that show in your holiday snapshots this year! The higher number of holidays during the winter season is believed to be because of the many pagan festivals that surrounded the Winter Solstice many years ago. That solstice happens in the third week of december, where there is Christmas, Hanukkah, New Years and other holidays all happening. With all those holidays and the gatherings that come with them, it’s likely to mean many opportunities for photos and showing off your smile. You want that smile to impress. Studies show that people that straighten their smiles often feel more confident than those who don’t. That confidence can be visible even while you are currently getting orthodontic treatment. Straight teeth are so important to people that 87% of people are willing to forego something they want for a year or more to be able to get braces. If you have braces, not only is it something to be proud of, but something to be admired. If you don’t have braces, getting them is a great way to give yourself an amazing gift just in time for the holidays. Traditional Metal Braces – These are the classic metal bracket and wire option that is most commonly chosen by patients. Patients who chose this option come in to have their wires tightened at each appointment. Ceramic Braces – These braces are a close cousin to metal braces. They have the same bracket and wire design of metal braces, except that they are made out of ceramic material. This helps decrease demineralization during your orthodontic treatment. Ceramic material is also naturally white, helping these braces to blend in with your teeth more than metal would. Lingual Braces – These are metal braces that are placed on the back of your teeth. Instead of just a square bracket, the metal must be custom-made to the shape of the back of your teeth. This is a discrete option that adults and teens love. Invisalign Treatment – This is the most invisible option available to our patients. Invisalign is a series of transparent aligners that you wear at night and throughout the day. You can remove them for eating, playing sports, cleaning your teeth and more. Maybe you already have braces. You can still make your smile wow in pictures by taking care of your smile. If you have metal or ceramic braces, our patients love to get colored bands that reflect the colors of the holidays. You can make your bands green and red for Christmas, blue and white for winter or any color you would like. Colorful bracket bands are just one way you can dress up your smile. If you already have braces, then you have already started on your journey to a better smile. Orthodontic treatment can correct mild to severe issues with bite and alignment, and can help correct speech impediments. It can bring the teeth and jaws into proper position, reducing your risk for oral health diseases such as tooth decay and gum disease. Straighter teeth are teeth that are easier to clean and less likely to have breaks and fractures from uneven mouth pressure. However, if you want your smile to dazzle in photos and at holiday get-togethers, you have to take care of it. The best way to do that is by brushing and flossing your teeth. Those two simple steps should be dones several times a day to keep your brackets clean and your teeth polished. Patients should brush 3 times a day or more to dislodge food and to clean the teeth after meals. Flossing should be done 1-2 times a day. Even though it takes a bit longer to do, don’t skip this step! If you do, you miss cleaning 40% of your tooth surfaces that can leave them open to decay, erosion and staining. Those are not things you want in a holiday photo. The end of the year is a time to start making goals for the new year. One of those goals can be focused around having better health in the new year. Many people don’t realize just how connected oral health is with overall health. Countless chronic conditions can become more mild or they can intensify depending on how well you are taking care of your oral health. For example, if you have diabetes, not taking care of your teeth and gums can lead to oral infections that are really hard to battle because you have diabetes. Your body is less able to fight those infections and the infections can spread, worsening your condition. However, if you do the basics of brushing your teeth, flossing and visiting your dentist and orthodontist like you should, you can keep your oral health in great shape. That makes it so your smile is amazing when your braces come off instead of damaged or decayed. To get some tips for taking care of your braces or for starting on an orthodontic plan, call Belmar Orthodontics today at (303) 225-9016! There are many services we offer when it comes to straightening the teeth, including Incognito lingual braces and traditional metal braces. These two options are very similar, however, lingual braces are made slightly different than traditional metal braces because of where and how they are worn. Both will give you amazing straightening results and both are services we provide. What choice is right for you? Which is best for your budget and for your time? We can help you know the difference between Incognito lingual braces and traditional metal brackets and help you choose which option you’ll love the most. As always, with professional orthodontic care through Belmar Orthodontics, you can be sure you receive quality straightening power no matter what option you choose. When you invest your time in braces, you are making an investment for the rest of your life. Your smile is one of the first physical features others see. Is that smile making an impression? We want all of our patients to have beautiful, healthy smiles. Why? Beautiful smiles are quite attractive to others. In studies, those with a straighter, more beautiful smile are seen as more attractive, trustworthy, confident and successful. Straighter smiles tell others that you take care of yourself. When it comes to your health, a straighter smile can also help reduce your risk for tooth decay and gum disease. This is because the teeth are aligned and much easier to clean, especially in between the teeth. Plaque has a harder time staying stuck on the teeth and causing problems when the teeth are easier to clean. So when it comes to both aesthetic and health reasons, braces can really change your life! There are many options when it comes to choosing the right braces for you. Some of the most popular options in orthodontics are traditional metal braces and Incognito lingual braces. These are the braces you probably imagine when you think of braces. They are traditional because they’ve been around for decades and are proven to straighten your teeth effectively. Traditional metal braces are worn on the front of the teeth. 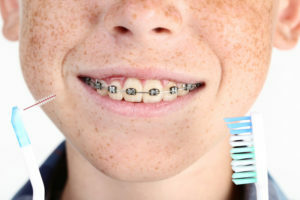 In times past, the term “metal mouth” was a term some used to describe those who had these braces. However, studies have shown that braces have become a luxury in modern times. 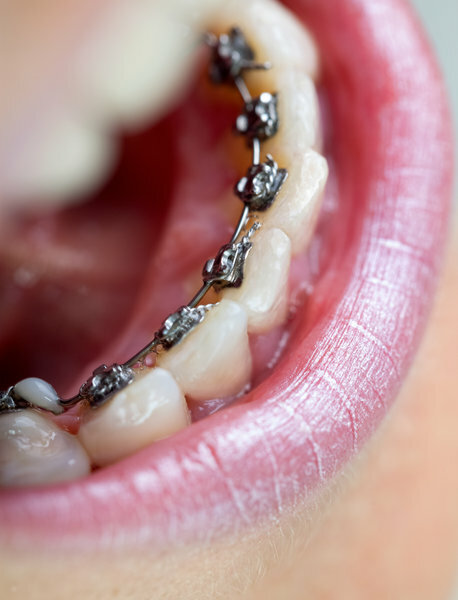 Traditional metal braces are more popular than ever, especially among teenagers. 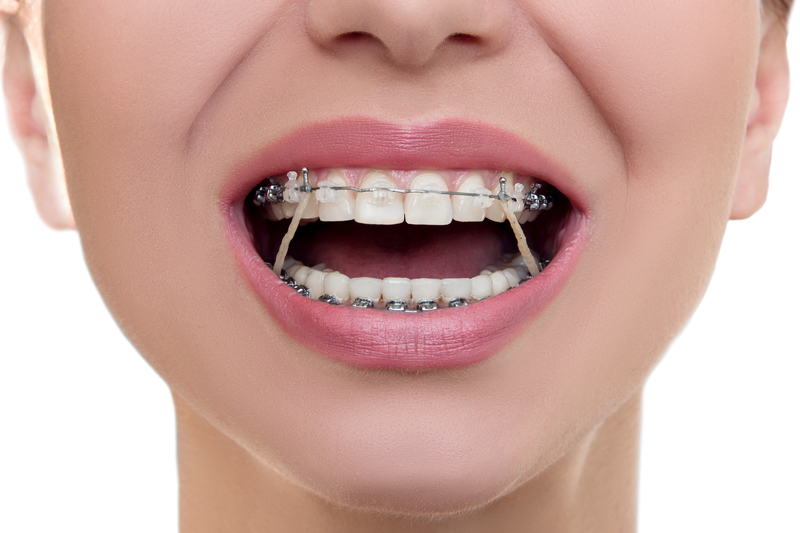 Metal braces have also taken on a much smaller and sleeker design so you no longer have a mouth so full of metal. The best part about traditional metal braces (besides how well they work) is that they are also the least expensive option when it comes to orthodontic care. 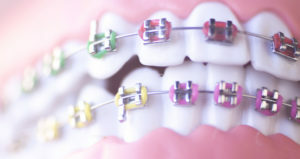 You can also dress up these braces with bright bands of color and express yourself the way you want. Love the idea of metal braces but don’t exactly love how noticeable they are? We are excited to be able to offer our patients an alternative to traditional metal braces: hidden lingual braces. There are about 4.5 million Americans that currently wear braces. Of those, 25% are adults. The majority of the rest of braces wearers are teenagers. It is common for some adults and teenagers to avoid orthodontic treatment because they find metal braces to be unattractive or distracting. However, most people love to have straighter teeth. The solution? Incognito lingual braces! With lingual braces, you can achieve the same results as traditional braces with a hidden treatment apparatus on the tongue-side of your teeth (by the tongue and palate). This is why they are referred to as “incognito” braces—they stay hidden (or incognito) as you straighten. We will take an impression of your teeth and make customized brackets fit perfectly to you. Lingual braces work much like traditional metal braces by slowly shifting the teeth into proper alignment. Unlike metal braces, each tooth must have its own installment of brackets and wires, as the lingual braces are shaped to each tooth back. Special training and technical expertise are needed to install these braces, and they do cost a bit more than traditional metal braces. However, you receive the trade-off of these braces being so undetectable. Invisalign – For those seeking an option that goes beyond Incognito braces, they can invest in Invisalign. This is a series of transparent aligners that are replaced every 1-2 weeks. They are virtually invisible and can be removed for eating, drinking, cleaning and sports. Ceramic Braces – Made from ceramic material, these white braces seek to have the functionality of traditional metal braces while blending into the teeth. Both the brackets and the wires can be made white so the braces are hard to see against the teeth. When it comes to receiving your braces, we want to give you options so that you truly enjoy your braces experience. Both traditional metal braces and lingual braces will work hard to straighten your smile. The dentists at Belmar Orthodontics have the expertise, training and experience to install both traditional metal braces or Incognito lingual braces to your smile. To start your orthodontic treatment with metal or lingual braces today, call our Belmar Orthodontics office today at (303) 225-9016! Young patients love the versatility of clear braces paired with colorful elastic ties. Clear braces provide something no other treatment option can; color REALLY stands out when you want it to. Kids love to stand out and love the creativity that they can express with their smile during orthodontic treatment. We want braces to be fun. Clear braces with colored elastics brings the fun in! Our Belmar Orthodontics staff is dedicated to helping you enjoy the smile transformation process. We want you smiling before, during, and after treatment! Clear braces offer you that confidence-boosting option. Give Me Some Color, Please! Kids love to choose color elastic ties (ligatures) for their braces that correspond with their favorite sports team, their school, or the holidays. Not sure which color combination to choose? Not to worry! Dr. Hardy and our friendly Lakewood staff can help you come up with a color combination that you will love to share! When it is time for your next adjustment you can continue the color combination or swap out for a new one! Or, go clear! Some of our adult patients like to opt for a more discreet look so they will choose clear elastics that make their orthodontic treatment almost invisible. Not all industry elastic bands provide you with stain resistance, but at Belmar Orthodontics we use top-of-the-line elastic bands fabricated by 3M Technologies. The National Institutes of Health published the findings of a study of the stain resistance of 5 different types of bands, and 3M elastics were shown to provide more resistance to staining than the competition. Adhering to proper oral hygiene with your braces and avoiding foods that stain will help clear-colored bands retain their desired color. Another advantage that clear braces have over traditional is their size and shape. Ceramic brackets sit lower on the teeth and have rounded edges. Because the bracket doesn’t sit as high on the tooth, they are less noticeable. The rounded edges also protect the soft tissues of your mouth from irritation or sores. Your Time with Braces is Temporary–Take Advantage of It! Although you may think your time with braces is going to feel like forever, you will be surprised how fast your treatment passes. Before you know it, this chapter of your life will be over and so will your time with braces. Make the most of it! Look for ways to make your smile unique and to have fun with it! If you take care of your teeth after your orthodontic treatment, and wear your retainers, this will be the only time you will need braces. Although at times they can challenge your patience, orthodontic braces today really are amazing technology that YOU get to benefit from! Braces of the past were bulky, uncomfortable and had longer treatment times. The braces of today are stylish, more effective, less obtrusive and can really help boost your confidence. Why Choose Belmar Orthodontics for Your Orthodontic Care? As active members of the American Dental Association and the American Association of Orthodontists, Dr. Hardy and our entire team of dental professionals are dedicated to creating a relaxed, personalized experience for our Belmar Orthodontics patients. We invite all our patients–both young and old–to actively participate in their care by asking lots of questions and expressing any concerns that might arise might during treatment. Educated patients know what they want, know what it takes to get it, and know better how to retain it when they are done. We offer many flexible treatment options to help you have the experience you want during and after your time with us. If you are considering ceramic clear braces, but still aren’t sure if this bracket system is for you, schedule a free consultation so we can discuss the pros and cons. Clear ceramic braces by 3M Technologies are rising in popularity because of their ability to offer you the pros of traditional braces without the cons of Invisalign, and with a much more aesthetic approach. Call today to learn all the things you can do with clear braces to make your treatment unique, fun and effective. You can make an appointment by contacting our office at 303.225.9016. We are excited to meet you and help you reach your smile goals! Clear ceramic braces replace the traditional metal bracket system of the past with the power and beauty of clear ceramics. Clear braces are just that (clear) making your braces less noticeable to others and with a material that is kinder to the enamel of your teeth. Clear braces are often selected by adults and older teenagers that don’t want the visibility of traditional braces, but like the convenience of a fixed system unlike Invisalign. Learning about the advantages of this bracket system can help you determine if they are for you. No one can argue with the clear, aesthetic design ceramic braces achieve. The translucent braces blend in naturally with your teeth making them much less noticeable than other types of braces. Their low-profile design also aids in rendering them virtually undetectable. For certain professionals this clear design is a necessity! Clear ceramic braces were designed for patients of any age who are looking for the confidence and the freedom to smile in any circumstance without worrying that their braces will distract or garner too much unwanted attention. Our younger patients often have a different outlook than our young professionals or adult patients–they want color! They want their braces to pop and make a statement. When colored bands are placed on clear ceramic brackets they really enhance the bracket and create an impressive “wow” factor unlike traditional metal brackets. Kids like to wear their local school’s colors or to dress their teeth to match a holiday. Ceramic brackets give them an option to have some fun! Ceramic braces differ from metal braces because they offer a smaller bracket design which takes up less space on the front of your tooth. Their innovative, fine-grained ceramic material is stronger than the competition making them less resistant to damage and more resilient during your treatment. They are also more resistant to staining and discoloration throughout the treatment process than their predecessors. Clarity™ ADVANCED Clear Ceramic Braces by 3M were designed with rounded corners to improve patient comfort and reduce irritation that occurs from brackets with rougher edges that come in contact with the soft tissues of your mouth. One of the questions many patients fail to ask when they are researching the different kinds of braces, and their associated advantages and disadvantages, is how easily are they removed after treatment? Some bracket bonding agents can be very harsh on your teeth and can take part of your tooth enamel during the removal process. You don’t have to worry about this happening with Clarity™ ADVANCED Ceramic Braces by 3M. Dr. Hardy abides by certain standards of care for his patients to ensure that they only receive the best of the best. It should be the goal of each dental practitioner to utilize the best material for patient treatment. Dr. Hardy not only believes in this principle, but makes it happen. Studies comparing the different materials designed exclusively for the bonding of brackets and attachments have been conducted to ensure that the highest bond strength is matched with the least amount of change to the tooth enamel upon application, during treatment, and at removal. Demineralization around the bracket is an undesired side effect of some orthodontic treatment materials and methods. 3M Technologies went a step further with their innovation to create a top-of-the-line bonding agent that prevent this demineralization around the bracket. Clarity™ ADVANCED Ceramic Braces do all this without sacrificing the superior, adhesive strength you should expect so brackets stay strong and fixed during the treatment process. Trusting the outcome of your orthodontic experience is dependent on the skills of your orthodontist and staff, but also on the products that they choose to use for your treatment. You can trust that your decision to use ceramic clear braces, designed and fabricated by 3M Technologies, will give you the results you deserve and expect. They are a recognized, industry giant with many accolades to their achievements in innovation and science. If you are in need of orthodontic treatment, but are worried about how the appliance may impact your appearance, you are not alone. Patients desire to have both a product that is innovative and effective, but also visually appealing. The dental industry has listened to this request and has answered by bringing you the innovation of clear ceramic braces. Clear ceramic braces by 3M Technologies offer you all the pros of traditional braces without the cons of Invisalign, and with a much more aesthetic approach. The best way to find out if you are a candidate for clear ceramic braces–and to learn more–is to schedule an appointment for an in-office consultation. Make an appointment by contacting our office today at 303.225.9016. We are excited to meet you and help you reach your smile goals!